Assemble at Changi Airport for Check in formlities. 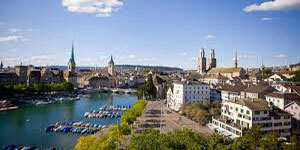 Depart on Singapore Airlines to Zurich, gateway to Switzerland. Enjoy the in-flight service. Upon arrival, proceed to the Rhinefalls in Schaffhausen, Europe's largest waterfall. Proceed to Lake Geneva Region. Drive to Lausanne and make a photo stop the Olympic Museum (no entrance). Proceed to Geneva for an orientation tour of this international city. Some free time for optional tour to Mont Blanc, the highest mountain in Central Europe. Drive pass the Swiss Riviera. Make a photo stop at Chateau Chillon. Continue to the famous ski village at Zermatt. Weather permitting. View the most famous peak, the Matterhorn. Travel into the Italian speaking part of Switzerland, to the garden city of Lugano. Some free time for photo taking before leaving for shopping at a factory outlet. The factory outlet features some famous brands like Versace, Gucci and Bally etc. Proceed to Lucerne for a walking tour of this medieval town. You may like to visit Bucherer, Europe's Number One for watches, jewellery and quality souvenirs. Drive to the medieval city of Bern for our city tour. 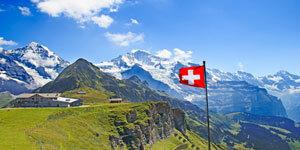 We leave for the lakeside resort of Interlaken. Evening enjoy a typical Swiss dinner. Free day for shopping or an optional tour to Jungfraujoch - Top of Eruope (3453m). Be transferred to the airport for your scheduled flight back to Singapore.